Lookonline.com is the longest running on-line fashion publication in the world. 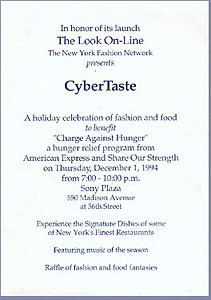 Before there was Style.com, Hypermode.com, FashionInternet.com, NYstyle.com, Fashionmall.com, Elle.com, hairnet.com, Hintmag.com and even Fashion.net, there was us. We have not always garnered the attention, funding or notoriety of some other of these fashion sites, but those in our industry, who have followed Lookonline's development over the years, know we helped pioneer the use of the Internet in providing real-time coverage of fashion events, regularly scheduled video reports, fashion blogs (DFR: Daily Fashion Report has been in blog format for almost 8 years and is recognized as the first fashion blog), market reports, editorial cartoons and original runway and event photography long before there were sites like Style.com or Fashionweekdaily. Since our official launch was on December 1, 1994 as a BBS dial-up service (does anyone even remember what a BBS service is or was? ), the Lookonline has been on-line "officially" for 16 years. However, we were already a BBS service by subscription in early 1993 (our first subscriber was Harper's Bazaar), and it was not until December of 1994 did we began a website (hosted under another domain name) in addition to our BBS site. Later in 1995, we discontinued our BBS service and concentrated on developing our website using our own domain name 'lookonline.com'. Does anyone besides our company remember the event? Sixteen years on-line is like a century in the development of the Internet. It was a struggle during the early years to gain recognition, much less respect for our site. I can still remember the days when fashion designers and publicists would look at me in disbelief, if they looked at me at all, when I talked about the importance of fashion websites. I was like the invisible man. I would be running around among them, but no one really knew or cared about fashion websites or, for that matter, even the Internet. Well, as the song says: "the times they are a changing", the Internet is now a force to be reckoned with, and fashion sites and blogs number in the many hundreds. I want to personally thank our many contributors who, over the past 16 years, have helped support our site. First and foremost my editor-in-chief, Marilyn Kirschner, whose fashion expertise and determination has set the tone for our editorial coverage; and senior editor Bernadine Morris, who lent her name, expertise and a guiding hand. Also special mention goes to Randy Brooke, an exceptional photographer who was always there when we needed him; and Diane Clehane for providing us with first class coverage of major fashion and entertainment events. Also special thanks goes to Susan Sommers for her timely suggestions, Adrienne Weinfield-Berg and Rhonda Erb, both good friends of lookonline, whose special assignment reporting gave our editorial greater depth; Stacy Lomman, Isabelle Erb and Muriel Geny-Triffaut for their contributions, and Grace Mirabella for hosting our first three 'Master of Fashion Video Interviews'. You were so ahead of the time!